The book Maggie’s Hammer alleges that, when Margaret Thatcher took power in 1979, she was met with a Great Britain that had been bankrupted by the socialists. So, Thatcher set in motion a plan to revive the country’s manufacturing core based upon a massive expansion of the arms industry. The plan worked. Today, Great Britain holds the No. 6 position for arms exports worldwide, and almost one in every five employees in Great Britain is associated in some fashion with the arms industry. But this success was achieved at a huge cost. Namely, the systemic and comprehensive corruption of Whitehall and Westminster. In order to build up arms sales, and then to maintain continuity of supply, the Thatcher government had to be prepared to do business with embargoed countries and entities, by employing unacceptable business practices, including wholesale bribery. Legitimate arms deals were processed through the ‘front-door.’ For more questionable dealings, a semi-official, and highly-organized, ‘back-door’ was put in place. It is the contention of Maggie’s Hammer that Hugh John Simmonds, CBE, a former member of the Conservative Party National Board of Finance, a close associate of Margaret Thatcher, and one of the best friends of the author of Maggie’s Hammer, was an essential element of the ‘back-door’ during the Thatcher years, helping to design the money-laundering pipeline leading back to senior British politicians, and providing other ‘support’ services of a more esoteric and sometimes deadly nature. The British media have known for some time of the illicit arms activities of Margaret Thatcher and her Conservative Party. What they have lacked is the money trail to prove it. Maggie’s Hammer provides the definitive clues as to that money trail, namely the money-laundering pipeline originally set in place by Hugh Simmonds. Maggie’s Hammer further alleges that Simmonds died because he knew too much about arms corruption. After his death, the Law Society bankrupted Simmonds’ Estate, valued at some $1.75 million, and then closed the books, leaving Simmonds’ family destitute. Simmonds’ father had to dig deep into funds that he had spent a lifetime accumulating, just to rescue Simmonds’ family. In this latter regard, Maggie’s Hammer details the continuation of arms corruption beyond the Thatcher years, and up to the present day. The failed attempts of Thatcher’s Conservative Party successor as British Prime Minister, Sir John Major, to halt the unseemly activity. The wholesale embrace of it by the various New Labour administrations of Tony Blair and George Brown, between 1997 and 2006. Footprints of its existence, even under the supposedly watchful eye of the Liberal Democrats, when the LibCon coalition government of David Cameron and Nick Clegg held sway, from 2010 to 2015. Alan Duncan, whom The Sunday Times fingered as the successor to Jonathan Aitken (after the latter’s imprisonment for perjury in 1999), as the Saudis’ Conservative arms bagman in Great Britain, was, until the government reshuffle in the summer of 2014, Minister of State at the Department for International Development, where he (Duncan) was personally responsible for overseeing the financial vetting of countries wishing to receive aid from Great Britain. That same vetting was (and remains) the process also used to determine whether or not those countries are suitable to receive Export Credit Guarantees in respect of arms purchases from British defense contractors. During Thatcher’s efforts to expand the arms industry in the Eighties, both by the ‘front-door’ and by the ‘back-door,’ the Export Credit Guarantee Program was illicitly commandeered massively to underwrite all manner of arms deals, which never paid off, and left the Program almost bankrupt. In forming his new majority Conservative government, after unexpectedly winning the British General Election in 2015, Prime Minister David Cameron made appointments to critical positions in that government and within the Conservative Party, which appointments suggested a full-blown revival of arms corruption and bribery, unhindered by scrutiny from meddlesome Liberal Democrat oversight. In July 2016, after succeeding David Cameron as British Prime Minister, one of the first acts of the new Conservative Party leader, Theresa May, was to return recently-knighted Sir Alan Duncan, KCMG to government, as Minister of State at the Foreign Office. 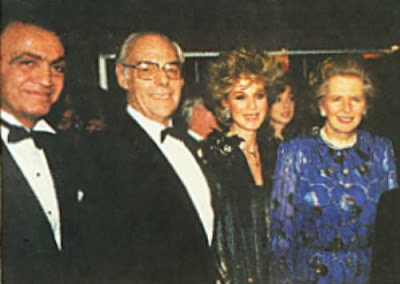 More information on this and other alleged footprints of British government arms corruption, all the way from Thatcher to May, are covered in Geoffrey Gilson’s continuing Facebook post on the subject.